We took a mini road trip down to San Diego this weekend to see the San Diego Crew Classic. 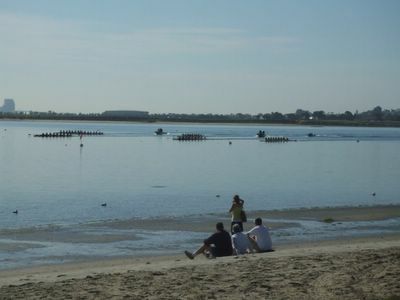 I had the opportunity to row in this regatta almost eight years ago and I was excited to see if it was as I remembered it. A friend from high school was rowing and we wanted to cheer her on as well. As it turned out, we didn't get to do much cheering since we were too far away and because a motorboat stalled out in the middle of the course and caused havoc.